Same great green chile sauce packaged in 4 single serving cups which is nearly equal to one 16 oz jar but in convenient, reduced waste, single serving containers saving on shipping weight. 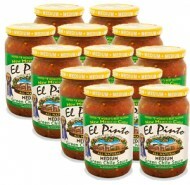 Huevos rancheros, enchiladas, chile con queso, meatloaf and green chile stew are family favorites with El Pinto Medium Green Chile Salsa. Just remove the foil top, warm and let your imagination run wild. 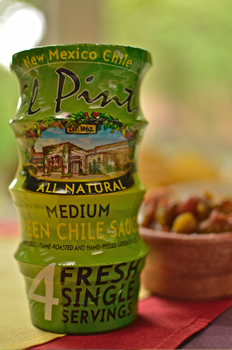 For the flavor of New Mexico it's got to be El Pinto Medium Green Chile Salsa! Savor the flavor or medium roasted green chiles as a topping or ingredient in your next appetizer or dish.